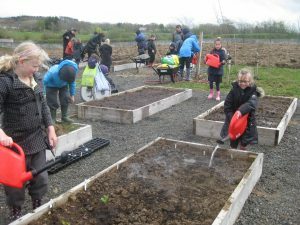 In 2016 it was our fifth year running our Outdoor Learning projects that satisfy from the early to the second stages of the “Curriculum for Excellence” with the local ASN Bases and Primary Schools in East Kilbride based at the Trusts Community Outdoor Learning Area. This area has been loaned to the EKCT by Trustee James Kean and we as a charity are looking to set up a more permanent base to allow these projects to grow and to be able to run other much needed projects to help our community in a more accessible area. We intend to strive to make sure that our programmes continue to be well received, a valuable community resource and that our lesson plans move with the times, ensuring they take on board any changes to the National Improvement Framework for Scottish Education, for Health and Wellbeing, literacy and numeracy. The typical programme and timescales are set by the school, requiring a minimum of a 6 week block surrounding outdoor activities. Children in stage Early are able to learn through play and beginning to develop interests. Stage one allows children to recognise the importance of learning from fellow students and understand what skills they have themselves, what skills their peers have and in turn this peer support fosters learning in a different way. Stage two allows children to become more aware of what they have achieved and allows for a progression to the next stages of learning. The length of each session is also set by the school of one hour per week. Each 1 hour session folds into the growing season where tasks are related to what is planted and promoting learning around this. 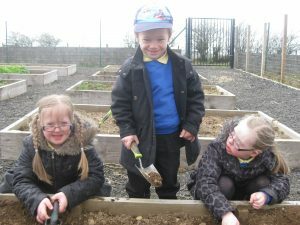 Once seeds are planted, week after week the children see each stage of growing and engage with other activities such as weeding, understanding the role of the soil, worms, spiders etc. As the groups work together it promotes social skills through interaction and collaborative working where they learn to work together to help each other. The partnership between the horticultural elements is linked with craft activities to compliment it, using recyclables to make wormerys, wind chimes and decorative garden stones. The school and children are encouraged to donate recyclables to add to existing craft supplies. This allows the project to continue all year round where weather would normally influence activities as craft projects can be completed indoors in spite of the weather. Our Outdoor Learning projects incorporate all five senses in order to underpin and enrich the learning experience. Partnerships also play an important role in this project, where the activities are not isolated but carried forward into the classroom learning connects the project to various topics in school and social skills helping to reduce barriers and develop not only the learning experience but also their life experience. This is a successful project with aims and objectives that while linked to the four capacities in the curriculum for excellence are not explicit in their approach, it is in the activities and delivery that permit the children to achieve the desired outcomes. We encourage the children to experience different outdoor learning activities; be able to feed horses, see pigs, sheep and cattle at close range, plant vegetables at our allotments and most importantly have fun. 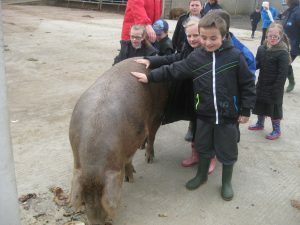 The children are able to enjoy making friends in a relaxed and new environment, where they are able to get fresh air in abundance, learn the basics about farm animals and their animal habitats, and be taken through the process of growing various vegetables, herbs from seeds and in general learning about the land. These outcomes also allow children to learn through playing; by engaging them in the process of growing food their learning experience is relevant. The knowledge the children take from the allotment is then carried into the classroom to reinforce other subjects they learn e.g. using pea pods by shelling them and counting with them, using vegetables like carrots and measuring their length. 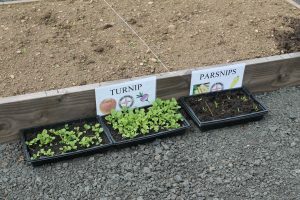 With English, they are encouraged to use any words they have learned from the allotment in sentences thus reinforcing their learning experience. The allotment produce is also used by the children, in collaboration with the school to make meals using what they have grown. 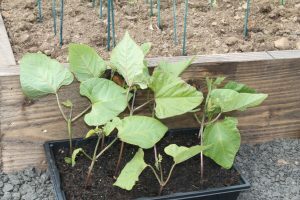 This allows a better understanding of food and its origins in turn this lets the children then question where other things come from and by growing and eating their own food it promotes a healthier lifestyle, in what they eat and the activity from being outside. The project promotes inclusion for all and in working together. The aims of the allotment project are to have fun, to facilitate outdoor learning and promote learning through five senses. In a classroom, the senses used are sight and sound; in the allotment all five senses are used. Touch used in planting seeds in the soil, using knowledge of textures to identify plants. Sight is used identifying flowers through colour or different vegetables by shape. 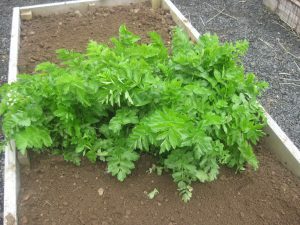 Smell is used when identifying herbs grown. Taste is also used as children are encouraged to sample what they grow and finally in listening, they are able to engage and absorb knowledge, by using all of their senses it allows a tangible experience. This project works closely with teachers and support workers who contribute as well as support in the activities. 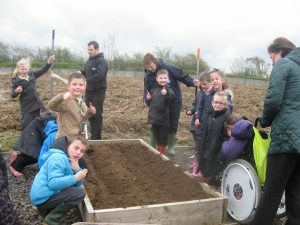 The success measures for the allotment lie in the evaluation from the school and support workers. This is in the form of feedback as to whether the activity was fun, informative, and if the children are learning new things. The Curriculum for Excellence sets out the framework for a more general well-rounded education system and to date we have worked with the Murray Primary School Base, Crosshouse Primary School Base, Greenhills Primary Base and the full school roll of 51 pupils at Greenburn Primary School. Each year we will continue to add to the existing relationships we have already fostered and will continue to strengthen our partnerships. 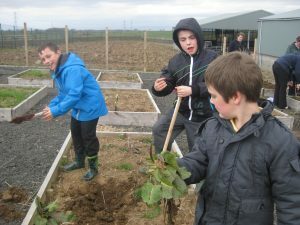 Partnering with local schools allows us to offer them support and a variety of learning opportunities at our community allotment area but the community benefit doesn’t stop there. That’s just one small ripple which is part of the effect of the charity doing the right thing by the people of East Kilbride. All the volunteers that help keep the areas tended during the growing seasons; whether that be weeding and watering the allotment beds and orchard, looking after the animals in the animal sanctuary, the workers who make up and repair the beds, the groups of older men and women who share their expertise and mentor others giving up their most valuable commodity, their time all benefit from this area. We are able to help our volunteer’s combat loneliness, aid in the recuperation of physical and mental illness, help in the recovery of alcohol and substance misuse and improve their general Health and Well being. These are all areas we would like to further develop running more programmes which are needed by the community.